As a member of the European Youth Parliament and the Federation of Young European Greens while in high school in her native Romania, Adriana Popa ’12 traveled to meetings all over Europe, but she had never visited the United States. Not that she didn’t want to. “I had become fascinated with the American education system. 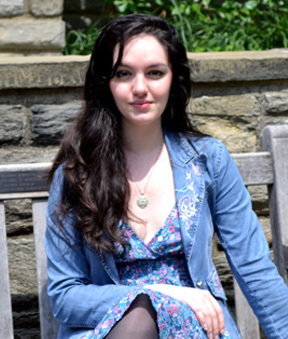 It seemed like a dream,” says the free-spirited honors political science major with a peace and conflict studies minor. She was disenchanted with the educational system in Romania, which she describes as the mere “transfer of information from a presumably reputable source (the professor) to a presumably unprofessional recipient (the student).” Challenging the status quo, independent exploration, and risking mistakes were discouraged. “Twenty-two years after communism, Romanians are still struggling to eradicate its legacy, and I think our inability to do so continues to cripple promising young generations,” says Popa, in immaculate, slightly accented English, acquired through British English lessons in school and hours of Cartoon Network shows. 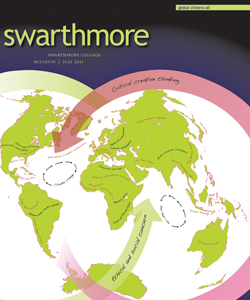 Popa had learned about Swarthmore via the published rankings. She applied to a diverse mix of Ivies, “big-name schools,” and top-ranked colleges. Fearing complications and possible obstacles at school and elsewhere, Popa kept her applications secret from all but her best friends. When acceptances began to arrive and her intentions became known, her teachers’ and the students’ reactions ranged from indifferent to mocking. She remained undaunted, ultimately choosing Swarthmore for its Honors Program and generous financial aid package. Popa says the College has more than lived up to her expectations. Objective and outspoken, she is not uncritical of the College. “Our international community here is great, but it’s not as big as it should be and not as diverse as it could be. We don’t have a lot of Europeans. I feel like a minority,” she says, conceding that Swarthmore’s limited financial aid funds for international students may define who can and cannot enroll. [The College currently budgets about $2 million to aid foreign nationals, based on need, but international student admissions decisions are not need blind.] She is certainly delighted to have made many good friends from Africa and Asia. “That’s true of me, too,” Popa says. FACTOID: International enrollment rose from ca. seven percent in 2008–2009 to ca. 11 percent in 2010–2011. Chart: International Students at Swarthmore and All International Students in the U.S.